An A380 taking off at the 2007 Paris Air Show. The Airbus A390 is a four-leveled, six-engined jet airliner created by Airbus S.A.S. Its first flight was on 1 November 2018. It is the world's largest aircraft, capable of carrying up to 1700 passengers or 1350 passengers in a typical seven-class configuration. As of 2016, five had been built, and was still in the "test-flight" stage. It began commercial operations with Air Koryo in late 2018, initially flying to Washington, D.C. Another 2 aircraft are due to join their fleet in March 2019 when they are able to start operations to London Heathrow Airport, England. The A390-900 has a range of 60,000 km (37,282mi), and a cruising speed of Mach 5.00 (6,174 km/h). This means it can circumnavigate the globe without refueling. However, this is a direct route with no passengers, and without the required safety margin, so the usable range is shorter. Passengers of the prototype have said that it is 100 times better than current planes. Airbus used similar cockpit layout, procedures and handling characteristics to those of other Airbus aircraft, to reduce crew training costs. Accordingly, the A380 features an improved glass cockpit, and fly-by-wire flight controls linked to side-sticks. The improved cockpit displays feature eight 15-by-20 cm (6-by-8-inch) liquid crystal displays, all of which are physically identical and interchangeable. These comprise two Primary Flight Displays, two navigation displays, one engine parameter display, one system display and two Multi-Function Displays. These MFDs are new with the A380, and provide an easy-to-use interface to the flight management system—replacing three multifunction control and display units. They include QWERTY keyboards and trackballs, interfacing with a graphical "point-and-click" display navigation system. One or two HUD (Head Up Display) is optional. Noise reduction was an important requirement in the A380's design, and particularly affects engine design. Both engine types allow the aircraft to achieve QC/2 departure and QC/0.5 arrival noise limits under the Quota Count system set by London Heathrow Airport, which is expected to become a key destination for the A380. The A380 can run on mixed synthetic jet fuel with a natural-gas-derived component. A three hour test flight on Friday, 1 February 2008 between the Airbus company facility at Filton in the UK to the main Airbus factory in Toulouse, France, was a success. One of the A380's four engines used a mix of 60 percent standard jet kerosene and 40 percent gas to liquids (GTL) fuel supplied by Shell. The aircraft needed no modification to use the GTL fuel, which was designed to be mixed with regular jet fuel. Sebastien Remy, head of Airbus SAS's alternative fuel program, said the GTL used was no cleaner in CO2 terms than regular fuel but it had local air quality benefits because it contains no sulphur. While most of the fuselage is aluminium, composite materials make up 25% of the A380's airframe, by weight. Carbon-fibre reinforced plastic, glass-fibre reinforced plastic and quartz-fibre reinforced plastic are used extensively in wings, fuselage sections (such as the undercarriage and rear end of fuselage), tail surfaces, and doors. The A380 is the first commercial airliner with a central wing box made of carbon fibre reinforced plastic, and it is the first to have a wing cross-section that is smoothly contoured. Other commercial airliners have wings that are partitioned span-wise in sections. The flowing, continuous cross-section allows for maximum aerodynamic efficiency. Thermoplastics are used in the leading edges of the slats. The new material GLARE (GLAss-REinforced fibre metal laminate) is used in the upper fuselage and on the stabilizers' leading edges. This aluminium-glass-fibre laminate is lighter and has better corrosion and impact resistance than conventional aluminium alloys used in aviation. Unlike earlier composite materials, it can be repaired using conventional aluminium repair techniques. Newer weldable aluminium alloys are also used. This enables the widespread use of laser beam welding manufacturing techniques — eliminating rows of rivets and resulting in a lighter, stronger structure. The A380 employs an Integrated Modular Avionics (IMA) architecture, first used in advanced military aircraft such as the F-22 Raptor, Eurofighter Typhoon, or Dassault Rafale. It is based on a commercial off-the-shelf (COTS) design. Many previous dedicated single-purpose avionics computers are replaced by dedicated software housed in onboard processor modules and servers. This cuts the number of parts, provides increased flexibility without resorting to customised avionics, and reduces costs by using commercially available computing power.. Together with IMA, the A380 avionics are very highly networked. The data communication networks use Avionics Full-Duplex Switched Ethernet, following the ARINC 664 standard. The data networks are switched, full-duplexed, star-topology and based on 100baseTX fast-Ethernet. This reduces the amount of wiring required and minimizes latency. . The Network Systems Server (NSS) is the heart of A380 paperless cockpit. It eliminates the bulky manuals and charts traditionally carried by the pilots. The NSS has enough inbuilt robustness to do away with onboard backup paper documents. The A380's network and server system stores data and offers electronic documentation, providing a required equipment list, navigation charts, performance calculations, and an aircraft logbook. All are accessible to the pilot from two additional 27 cm (11 inch) diagonal LCDs, each controlled by its own keyboard and control cursor device mounted in the foldable table in front of each pilot. Power-by-wire flight control actuators are used for the first time in civil service, backing up the primary hydraulic flight control actuators. During certain maneuvers, they augment the primary actuators. They have self-contained hydraulic and electrical power supplies. They are used as electro-hydrostatic actuators (EHA) in the aileron and elevator, and as electrical backup hydrostatic actuators (EBHA) for the rudder and some spoilers. The aircraft's 350 bar (35 MPa or 5,000 psi) hydraulic system is an improvement over the typical 210 bar (21 MPa or 3,000 psi) system found in other commercial aircraft since the 1940s. First used in military aircraft, higher pressure hydraulics reduce the size of pipelines, actuators and other components for overall weight reduction. The 350 bar pressure is generated by eight de-clutchable hydraulic pumps. Pipelines are typically made from titanium and the system features both fuel and air-cooled heat exchangers. The hydraulics system architecture also differs significantly from other airliners. Self-contained electrically powered hydraulic power packs, instead of a secondary hydraulic system, are the backups for the primary systems. This saves weight and reduces maintenance. The A380 uses four 150 kVA variable-frequency electrical generators eliminating the constant speed drives for better reliability. The A380 uses aluminium power cables instead of copper for greater weight savings due to the number of cables used for an aircraft of this size and complexity. The electrical power system is fully computerized and many contactors and breakers have been replaced by solid-state devices for better performance and increased reliability. The A380 features a bulbless illumination system. LEDs are employed in the cabin, cockpit, cargo and other fuselage areas. The cabin lighting features programmable multi-spectral LEDs capable of creating a cabin ambience simulating daylight, night or shades in between. On the outside of the aircraft, HID lighting is used to give brighter, whiter and better quality illumination. These two technologies provide brightness and a service life superior to traditional incandescent light bulbs. The A380 was initially planned without thrust reversers, as Airbus believed it to have ample braking capacity. The FAA disagreed, and Airbus elected to fit only the two inboard engines with them. The two outboard engines do not have reversers, reducing the amount of debris stirred up during landing. The A380 features electrically actuated thrust reversers, giving them better reliability than their pneumatic or hydraulic equivalents, in addition to saving weight. The A380 produces 50% less cabin noise than a 747 and has higher cabin air pressure (equivalent to an altitude of 1500 metres (5000 ft) versus 2500 metres (8000 ft)); both features are expected to reduce the effects of travel fatigue. The upper and lower decks are connected by two stairways, fore and aft, wide enough to accommodate two passengers side-by-side. In a 555-passenger configuration, the A380 has 33% more seats than a 747-400 in a standard three-class configuration but 50% more cabin area and volume, resulting in more space per passenger. Its maximum certified carrying capacity is 853 passengers in an all-economy-class configuration. The two full-length decks and wide stairways allow multiple seat configurations of the Airbus A380. The announced configurations go from 450 (Qantas) up to 644 passengers (Emirates Airline two-class configuration). Compared to a 747, the A380 has larger windows and overhead bins, and 60 cm (2 ft) of extra headroom. The wider cabin allows for up to 48 cm (19 inch) wide economy seats at a 10 abreast configuration on the main deck, while 10 abreast seating on the 747 has a seat width of only 43.7 cm (17.2 inch) (seat pitch varies by airline). Airbus' initial publicity stressed the comfort and space of the A380's cabin, anticipating installations such as relaxation areas, bars, duty-free shops, and beauty salons. Virgin Atlantic Airways already offers a bar as part of its "Upper Class" service on its A340 and 747 aircraft, and has announced plans to include casinos, double beds, and gymnasiums on its A380s. Singapore Airlines offers twelve fully-enclosed first-class suites on its A380, each with one full and one secondary seat, full-sized bed, desk, personal storage. Four of these suites are in the form of two "double" suites featuring a double bed. Qantas Airways has shown their product which features a long flat-bed that converts from the seat but does not have privacy doors. Emirates Airline's fourteen first-class private suites have shared access to two "shower spas". First and business class passengers have shared access to a snack bar and lounge with two sofas, in addition to a first-class-only private lounge. Early critics claimed that the A380 would damage taxiways and other airport surfaces. However, the pressure exerted by its wheels is lower than that of a Boeing 747 or Boeing 777 because the A380 has 22 wheels, four more than the 747, and eight more than the 777. Airbus measured pavement loads using a 540-tonne (595 short tons) ballasted test rig, designed to replicate the landing gear of the A380. The rig was towed over a section of pavement at Airbus' facilities that had been instrumented with embedded load sensors. Based on its wingspan, the U.S. FAA classifies the A380 as a Design Group VI aircraft, and originally required a width of 60 m (200 ft) for runways and 30 m (100 ft) for taxiways, compared with 45 m (150 ft) and 23 m (75 ft) for Design Group V aircraft such as the Boeing 747. The FAA also considered limiting the taxi speed of the A380 to 25 km/h (15 mph) when operating on Group V infrastructure, but issued waivers related to the speed restriction and some of the proposed runway widening requirements. Airbus claimed from the beginning that the A380 could safely operate on Group V runways and taxiways, without the need for widening. In July 2007, the FAA and EASA agreed to let the A380 operate on 45 m runways without restrictions. The A380 was designed to fit within an 80 × 80 m airport gate, and can land or take off on any runway that can accommodate a Boeing 747. Its large wingspan can require some taxiway and apron reconfigurations, to maintain safe separation margins when two of the aircraft pass each other. Taxiway shoulders may be required to be paved to reduce the likelihood of foreign object damage caused to (or by) the outboard engines, which overhang more than 25 m (80 ft) from the centre line of the aircraft. Any taxiway or runway bridge must be capable of supporting the A380's maximum weight. The terminal gate must be sized such that the A380's wings do not block adjacent gates, and may also provide multiple jetway bridges for simultaneous boarding on both decks. Service vehicles with lifts capable of reaching the upper deck should be obtained, as well as tractors capable of handling the A380's maximum ramp weight. The A380 test aircraft have participated in a campaign of airport compatibility testing to verify the modifications already made at several large airports, visiting a number of airports around the world. In November 2006 the ICAO issued new interim recommendations. Replacing a blanket 10 nmi separation for aircraft trailing an A380 during approach, the new distances were 6 nmi, 8 nmi and 10 nmi respectively for non-A380 "Heavy", "Medium", and "Light" ICAO aircraft categories. These compared with the 4 nmi, 5 nmi and 6 nmi spacing applicable to other "Heavy" aircraft. Another A380 following an A380 should maintain a separation of 4 nmi. On departure behind an A380, non-A380 "Heavy" aircraft are required to wait two minutes, and "Medium"/"Light" aircraft three minutes for time based operations. The ICAO also advised to use the suffix "Super" to the air traffic control to distinguish the A380 from other "Heavy" aircraft. Airbus top sales executive and COO John Leahy confirmed the plans for an enlarged variant, the A380-900 which is a slight stretch of the A380-800 from 73m to 79.4m in length. This version would have a seat capacity of 650 passengers in standard configuration, and around 900 passengers in economy-only configuration. The development of the A380-900 is planned to start once production of the A380-800 variant reaches 40 planes per year, expected to be in 2010. 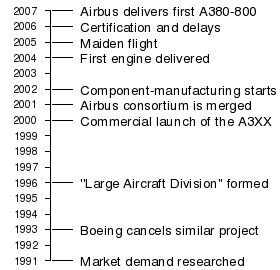 Given this timeline, the first A380-900s could be delivered to customers around 2015, about the same time as the A380-800F freighter variant. Airlines including Emirates, Virgin Atlantic, Cathay Pacific, Air France/KLM, and Lufthansa, as well as leasing company ILFC have already expressed interest in the extended model. According to an interview in Airliner World magazine's December issue, Singapore Airlines CEO Chew Choon Seng revealed at the delivery of their first A380-800 that the airline is keeping their options open with their order, by only defining their first ten A380s as -800s; the remaining nine aircraft could be switched to -900s. Parallel to the design of the A380, Airbus conducted the most extensive and thorough market analysis of commercial aviation ever undertaken. As of 2007, Airbus estimated a demand for 1,283 passenger planes in the category VLA (Very Large Aircraft, with more than 400 seats) for the next 20 years if the airport congestion remains at the current level. If the congestion increases, the demand could reach up to 1,771 VLAs. Most of this demand will be due to the urbanization and rapid economic growth in Asia. The A380 will be used on relatively few routes, between the most saturated airports. Airbus also estimates a demand for 415 freighters in the category 120-tonne plus. Boeing, which offers the only competition in that class, the 747-8, estimates the demand for passenger VLAs at 590 and that for freighter VLAs at 370 for the period 2007-2026. In 2006 two industry analysts anticipated 400 and 880 A380 sales respectively by 2025. As of February 2008, there were 191 orders for the A380, while there were 20 for the 747-8I (both not including VIP orders) and 81 for the 747-8F. The break-even for the A380 was initially supposed to be reached at 270 units. Due to the delays and the falling exchange rate of the US dollar, it increased to 420 units. In April 2007, Airbus CEO Louis Gallois said that break-even had risen further, but declined to give the new figure. As of April 2008, the list price of an A380 was US$ 317.2 to 337.5 million, depending on equipment installed. Sixteen customers have ordered the A380, including an order from aircraft lessor ILFC and one VIP order. Total orders for the A380 stand at 198 as of 24 July 2008. A total of 27 orders originally placed for the freighter version, A380-800F, were either cancelled (20) or converted to A380-800 (7), following the production delay and the subsequent suspension of the freighter program. Airbus' new schedule is to deliver 12 A380s in 2008 and 21 in 2009. ↑ 5.0 5.1 5.2 5.3 5.4 Error on call to Template:cite book: Parameter title must be specifiedNorris, Guy; Mark Wagner (2005). Airbus A380: Superjumbo of the 21st Century. Zenith Press. ↑ 6.0 6.1 6.2 Babka, Scott (5 September 2006). "EADS: the A380 Debate" (PDF). Morgan Stanley. http://www.leeham.net/filelib/A380DEBATEFINAL.pdf. Retrieved 2006-09-13. ↑ 7.0 7.1 "Towards Toulouse". Flight International. 20 May 2003. http://www.flightglobal.com/Articles/2003/05/20/165712/Towards+Toulouse.html. Retrieved 2006-09-18. ↑ "A380 convoys". IGG.FR. 28 October 2007. http://www.igg.fr/. Retrieved 2007-10-28. ↑ 9.0 9.1 Kingsley-Jones, Max (20 December 2005). "A380 powers on through flight-test". Flight International. http://www.flightglobal.com/articles/2005/12/20/203708/a380-powers-on-through-flight-test.html. Retrieved 2007-09-25. ↑ A380 Successfully completes its first flight. Flug Revue (27 April 2005). Retrieved on 2008-03-14. ↑ "Airbus tests A380 jet in extreme cold of Canada". MSNBC. 8 February 2006. http://www.msnbc.msn.com/id/11236081/. Retrieved 2006-09-16. ↑ "Airbus to reinforce part of A380 wing after March static test rupture". Flight International. 23 May 2006. http://www.flightglobal.com/articles/2006/05/23/206797/airbus-to-reinforce-part-of-a380-wing-after-march-static-test.html. Retrieved 2008-03-07. ↑ 13.0 13.1 Daly, Kieran (6 April 2006). "Airbus A380 evacuation trial full report: everyone off in time". Flight International. http://www.flightglobal.com/Articles/2006/04/06/Navigation/177/205793/Airbus+A380+evacuation+trial+full+report+everyone+off+in.html. Retrieved 2006-09-16. ↑ "Pictures: Airbus A380 clears European and US certification hurdles for evacuation trial". Flight International. 29 March 2006. http://www.flightglobal.com/Articles/2006/03/29/Navigation/177/205739/Pictures+Airbus+A380+clears+European+and+US+certification+hurdles+for+evacuation.html. Retrieved 2006-09-16. ↑ "Airbus A380 completes test flight". BBC News. 4 September 2006. http://news.bbc.co.uk/1/hi/business/5312020.stm. Retrieved 2006-09-16. ↑ EASA Type-Certificate Data Sheet TCDS A.110 Is sue 03 (PDF). EASA (14 December 2007). Archived from the original on 2008-05-28. Retrieved on 2008-05-19. ↑ 17.0 17.1 FAA Type Certificate Data Sheet NO.A58NM Rev 2 (PDF). FAA (14 December 2007). Retrieved on 2008-01-07. ↑ 18.0 18.1 Heinen, Mario (19 October 2006). The A380 programme (PDF). EADS. Archived from the original on 2006-11-03. Retrieved on 2006-10-19. ↑ Kingsley-Jones, Max (18 July 2006). "The race to rewire the Airbus A380". Flight International. http://www.flightglobal.com/Articles/2006/07/18/Navigation/252/207894/Farnborough+first+news+The+race+to+rewire+the+Airbus.html. Retrieved 2006-09-21. ↑ Clark, Nicola (4 September 2006). "Airbus replaces chief of jumbo jet project". International Herald Tribune. Archived from the original on 2006-09-05. http://web.archive.org/web/20060905205404/http://www.iht.com/articles/2006/09/04/business/airbus.php. Retrieved 2006-09-16. ↑ Airbus confirms further A380 delay and launches company restructuring plan. Airbus S.A.S (3 October 2006). Retrieved on 2006-10-03. ↑ Robertson, David (3 October 2006). "Airbus will lose €4.8bn because of A380 delays". The Times. http://business.timesonline.co.uk/article/0,,9077-2387999,00.html. Retrieved 2006-10-03. ↑ Quentin Wilber, Dell (8 November 2006). "Airbus bust, Boeing boost". The Washington Post. http://www.washingtonpost.com/wp-dyn/content/article/2006/11/07/AR2006110701506.html. Retrieved 2006-11-08. ↑ ILFC to defer its Airbus A380 order until at least 2013, ditching freighter variants for passenger configuration. Airbus S.A.S..
↑ Airbus says A380F development 'interrupted'. Flight Global. Retrieved on 2007-03-06. ↑ Airbus has no timeline on the A380 freighter. Flight Global. Retrieved on 2008-03-20. ↑ Emirates Airlines reaffirms commitment to A380 and orders additional four. Airbus S.A.S..
↑ Singapore Airlines boosts Airbus fleet with additional A380 orders. Airbus S.A.S..
↑ Qantas signs firm order for eight additional A380s. Airbus S.A.S..
↑ Air France to order two additional A380s and 18 A320 Family aircraft. Airbus S.A.S..
↑ Qatar Airways confirms order for 80 A350 XWBs and adds three A380s. Airbus S.A.S..
↑ Korean Air expands A380 aircraft order. Airbus S.A.S..
↑ "Airbus stumbles as it tries to transition from A380 Wave 1 to Wave 2 design". Flight Global. 2008-05-19. http://www.flightglobal.com/articles/2008/05/19/223748/airbus-stumbles-as-it-tries-to-transition-from-a380-wave-1-to-wave-2.html. Retrieved 2008-05-26. ↑ 36.0 36.1 "A380 production ramp-up revisited". Airbus. 13 May 2008. http://www.airbus.com/en/presscentre/pressreleases/pressreleases_items/08_05_13_A380_ramp_up_revisited.html. Retrieved 2008-05-13. ↑ "First A380 Flight on 25-26 October". Singapore Airlines. 2007-08-16. http://www.a380.singaporeair.com/content/news/newsrelease/20070816/index.html. Retrieved 2007-08-16. ↑ "SIA's Chew: A380 pleases, Virgin Atlantic disappoints". ATW Online. 2007-12-13. http://www.atwonline.com/news/story.html?storyID=11132. Retrieved 2007-12-13. ↑ "A380 to fly to London from 18 March". Singapore Air. 2008-01-30. http://www.a380.singaporeair.com/content/news/newsrelease/20080130/index.html. ↑ "First A380 commercial flight lands at Tokyo's Narita Airport". Airbus. 2008-05-20. http://www.airbus.com/en/myairbus/headlinenews/headlineitem/08_05_20_a380_narita_airport.html. ↑ "Snapshots: Singapore Airlines Successfully Completes First A380 Commercial Flight to Beijing". 2008-08-02. http://en.carnoc.com/list/8/8242.html. Retrieved 2008-08-05. ↑ "Snapshots: Singapore Airlines 1000 flights with A380". 2008-08-04. http://www.singaporeair.com/mediacentre/pacontent/news/NE_4108.jsp. Retrieved 2008-08-05. ↑ "Singapore Airlines receives sixth Airbus A380". 2008-09-18. http://www.reuters.com/article/rbssIndustryMaterialsUtilitiesNews/idUSSGC00228320080918. Retrieved 2008-09-19. ↑ "Emirates A380 arrives in New York!". 2008-08-03. http://www.gadling.com/2008/08/03/emirates-a380-arrives-in-new-york/. Retrieved 2008-08-03. ↑ "Emirates A380 Lands At New York's JFK". 2008-08-01. http://news.airwise.com/story/view/1217629915.html. Retrieved 2008-08-05. ↑ "Emirates to start A380 flights to New York, London". Reuters. 2008-03-02. http://www.reuters.com/article/rbssIndustryMaterialsUtilitiesNews/idUSL0249597320080302. Retrieved 2008-03-24. ↑ "First Airbus A380 delivered to Qantas". 2008-09-19. http://www.airbus.com/en/presscentre/pressreleases/pressreleases_items/08_09_19_a380_delivery_qantas.html. Retrieved 2008-09-19. ↑ The triple-deck cargo hauler. Airbus S.A.S..
↑ 55.0 55.1 A380 flight deck. Airbus S.A.S. Retrieved on 2006-09-16. ↑ Trent 900 engine. Rolls-Royce. Retrieved on 2006-09-16. ↑ GP7200 engine features. Engine Alliance. Retrieved on 2006-09-16. ↑ Lalor, Dan (1 February 2008). "A380 makes test flight on alternative fuel". Reuters. http://www.reuters.com/article/environmentNews/idUSL0120071420080202?rpc=64. Retrieved 2008-02-01. ↑ Dunn, Graham (1 February 2008). "PICTURES: Airbus conducts A380 alternative-fuel demonstration flight". Flight Global. http://www.flightglobal.com/articles/2008/02/01/221245/pictures-airbus-conducts-a380-alternative-fuel-demonstration-flight.html. Retrieved 2008-02-01. ↑ Airbus A380 Superjumbo. Aerospace-Technology.com. Retrieved on 2006-09-26. ↑ Rötzer, Isolde (1 January 2005). Laser Beam Welding (.pdf). Fraunhofer Society Material and Beam Technology - IWS, Dresden, Germany. Archived from the original on 2006-02-23. Retrieved on 2007-05-14. ↑ 66.0 66.1 Adams, Charlotte (1 July 2002). "Test cards for the Airbus A380". Aviation Today. http://www.aviationtoday.com/av/categories/commercial/12760.html. Retrieved 2007-10-16. ↑ 67.0 67.1 Adams, Charlotte (1 October 2001). "A380: ‘more electric’ aircraft". Aviation Today. http://www.aviationtoday.com/cgi/av/show_mag.cgi?pub=av&mon=1001&file=1001a380.htm. Retrieved 2006-09-26. ↑ Cabin Interior, Mood Lightning. Diehl Aerospace, Germany. Retrieved on 2007-05-14. ↑ Inside the A380. ArabianBusiness.com. Retrieved on 2007-10-28. ↑ Onboard the Airbus A380. Fodors. Retrieved on 2007-10-28. ↑ Singapore Airlines A380 - Comfort, space and luxury. Singapore Airlines. Retrieved on 2007-10-28. ↑ 747-400 Cross Sections. Boeing CA. Retrieved on 2008-06-19. ↑ Airbus Cabin Showroom. Airbus S.A.S.. Retrieved on 2007-05-14. ↑ Singapore Airlines A380 - A class beyond first. Singapore Airlines. Retrieved on 2007-10-28. ↑ Qantas and the A380. Qantas. Retrieved on 2007-12-15. ↑ 777 Family. Boeing. Retrieved on 2007-09-02. ↑ Dupont, Willy-Pierre. A380 - A solution for airports (PDF). Airbus S.A.S.. Archived from the original on 2004-09-11. Retrieved on 2007-05-19. ↑ Airport Design (PDF). FAA (29 September 1989). Retrieved on 2006-09-24. ↑ Minimum Requirements to Widen Existing 150-Foot Wide Runways for Airbus A380 Operations (PDF). FAA (13 February 2004). Retrieved on 2006-09-24. ↑ Use of non-standard 75-foot-wide straight taxiway sections for Airbus 380 taxiing operations (PDF). FAA (April 2006). Retrieved on 2006-09-24. ↑ Airbus A380 approved to operate on 45 m runways. Airbus S.A.S. (31 July 2007). Retrieved on 2007-10-01. ↑ 88.0 88.1 88.2 A380 Airplane Characteristics Rev: 2008-01-31 (.pdf). Airbus S.A.S. (2008-01-03). Archived from the original on 2005-05-22. Retrieved on 2007-04-30. ↑ "Successful landing – the A380 in Frankfurt". Lufthansa. 29 October 2005. http://a380.lufthansa.com/en/html/presse/n051029/index.php. ↑ "Airbus A380 wake vortex study completed". Airbus S.A.S.. 28 September 2006. http://www.airbus.com/en/presscentre/pressreleases/pressreleases_items/06_09_28_vortex_study.html. Retrieved 2006-09-30. ↑ Airbus A380 vortex-revised guidance material (PDF). ICAO (16 January 2007). Retrieved on 2007-11-09. ↑ "New guidelines show shorter A380 separation distances". Flight Global. 22 August 2008. http://www.flightglobal.com/articles/2008/08/22/315062/new-guidelines-show-shorter-a380-separation-distances.html. Retrieved 2008-09-06. ↑ Flying by Nature Airbus Global Market Forecast 2007-2026 (PDF). Airbus S.A.S. (31 January 2008). Archived from the original on 2008-04-09. Retrieved on 2008-03-14. ↑ Boeing Current Market Outlook 2007 (PDF). Boeing Commercial Airplanes (20 November 2007). Archived from the original on 2008-04-09. Retrieved on 2008-03-14. ↑ "Airbus includes surcharge in 2008 catalogue prices". Flight Global. 22 April 2008. http://www.flightglobal.com/articles/2008/04/22/223184/airbus-includes-surcharge-in-2008-catalogue-prices.html. Retrieved 2008-04-22. ↑ A380 Update press kit. Airbus S.A.S (24 July 2008). Retrieved on 2008-08-05. ↑ "A380 powers on through flight-test", Flight International, 20 December 2005. ↑ Exemption No. 8695. Federal Aviation Authority (2006-03-24). Retrieved on 2008-10-02.